William Rose was born in Yeovil in 1883, the son of leather dresser Walter Rose (b1860) and Alice Alma née Lane (1856-1935). Walter and Alice had nine children, all born in Yeovil; Annie (b1881), William, Ellen (b1886), Flora (1889-1938), Frederick (1891-1982), Louisa May (1893-1911), Frances Mary (1896-1971), Charles Percy (1898-1972) and George (1900-1966). In the 1891 census the family were listed living at 1 Gold Croft. At this time 7-year old William (recorded as Willie) was a scholar. By the time he was 17, William was working as a general blacksmith and the family were living at 5 Grass Royal. After this William did not appear in the census. The most likely explanation being that he served as a regular soldier in Royal Army Medical Corps, the Royal Garrison Artillery and the Mechanical Transport - after which he was placed on the Reserve List. After leaving the army he is known to have worked at the Nautilus Works on Reckleford and for monumental masons Appleby & Childs. He was also a Salvation Army insurance agent. In the spring of 1914 William married Gertrude Mary Bicknell (b1882) at Yeovil. They set up home at 3 Mount Pleasant. 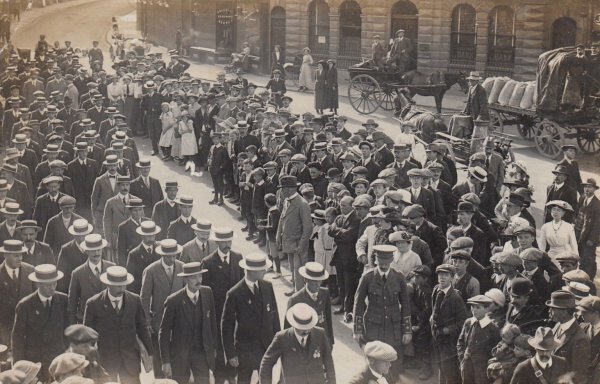 Since William was a Reservist, he was called up on the outbreak of war in 1914. He became a Gunner in an Anti-Aircraft Battery, Royal Garrison Artillery. His Service Number was 21472. In 1914, the new War Office staff proposed to raise a number of Anti-Aircraft Sections, which would officially be Companies of the Royal Garrison Artillery. The target was to raise one Section for each of the Divisions that were going to France. In the event, this was not fully achieved until 1916. Some men were posted from all three branches of the Royal Artillery, but they were too few and new recruits would be needed to properly establish these units. In addition, they would need motorised transport to be provided by the Army Service Corps. Six Sections were formed by November 1914, each consisting of (in theory two, but in practice one) 1-pounder (1.46 inch) Vickers Pom-Pom guns, each under a Captain. The first units arrived in France in September 1914. They soon discovered that the 1-pounders, not having been designed for the application, were of limited value in an anti-aircraft role. As it was becoming ever more apparent that air observation, bombing and fighting was an important aspect of the war, the demand for AA increased. GHQ in France ordered that not only should there be one Section per Division, but another 15 to cover the lines of communication. By August 1915, there were in all 13 Sections in France. In October 1915, all existing guns were grouped into four-gun Batteries denoted by letters of the alphabet (William was in 'M' Battery), and in the following month a specialist air gunnery officer was attached to the staff of the Major-General Royal Artillery at each Army HQ. By July 1916, seventy of the total 113 AA guns in the field were of the 13-pounder 9-cwt type. Night bombing of the camps and roads behind the lines became a feature of the Somme campaign. 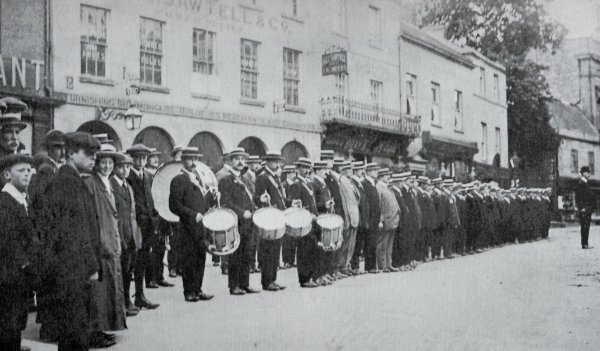 In November 1916, the existing Battery organisation was abolished and three or four Sections were allotted to each Corps. Each Army HQ now had an AA Group HQ staff. At the front, individual AA regions were defined, each having an AA Defence Commander who would oversee a number of Sections plus various searchlight and machine gun crews: this was called an AA Group. Each of the five British Armies had a Group, and one large one of nineteen Sections, covered the Lines of Communication. The first of a new type of gun, the 3-inch 20-cwt arrived. By the end of the year there were ninety-one AA Sections of the RGA in France, of which two were Canadian. Ten were equipped with the 3-inch gun. In addition there were by now twenty-two Searchlight Sections of the RE. In 1916 an Anti-Aircraft Section consisted of forty-three men in total: 2 officers, two gun detachments of twelve men each (of which one in each was a driver of the ASC), 2 telephonists, 1 linesman, 4 height finders, 4 Wilson-Dalby Detector Operators, 2 Height and Fuse Indicator men, 1 Order Board Setter, 1 lookout man (Air sentry), 1 orderly and 1 cook. The preparations for the Battle of Cambrai in November 1917 were novel in many respects. For the first time, an air defence plan was an integral part of the overall scheme of attack. Seven AA Batteries were allotted to the front that was to be assaulted, and their covering fire swept up to 3500 yards ahead of the British line. Two gun sections were made ready to follow up the advance. With guns that had not been designed for the purpose and appropriate equipment late in being developed, the AA was perhaps more of a deterrent than an actually effective weapon. The complexities of deflection firing, weather conditions, target fixing, variable gun condition, etc made for a very difficult operation. Training was all too brief, and methods experimental. Most of the gun Sections arrived in the field of battle without having fired a live shot. One source says that for example, in the busy week ending 27 April 1918, a total of 10 enemy aircraft were shot down and another 5 damaged, of a total of 2039 engaged. Because the Batteries moved around so much it is not possible to determine exactly where William fought, although its is known that "He took part in the retreat from Mons and most of the big battles of the war, having several narrow escapes." 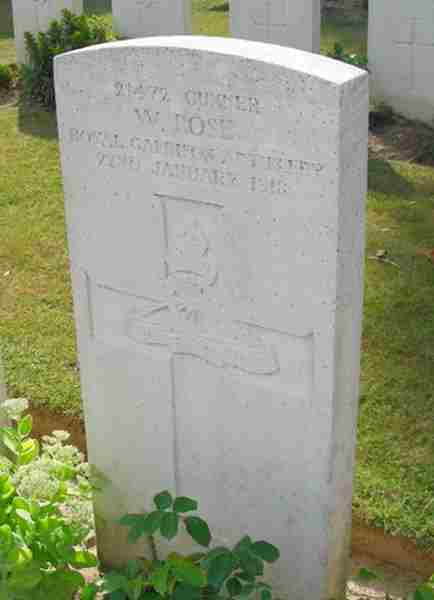 William Rose was killed in action on 22 January 1918. 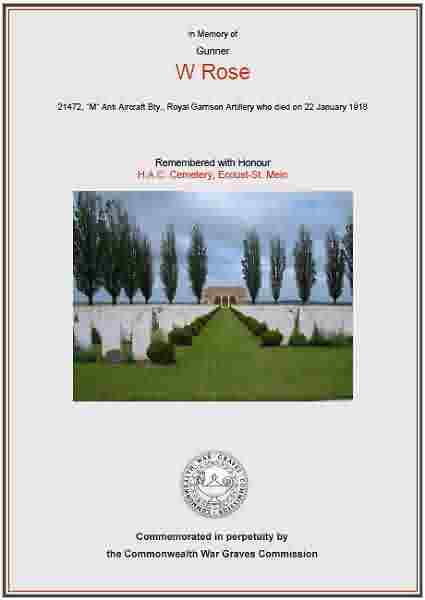 He was 34 years old and in its edition of 8 February 1918 the Western Gazette reported "Information has been received that Gunner W Rose, serving with an ant-aircraft battery has been killed in action. His wife resides at 3 Mount Pleasant, Newtown. He has been serving in France since 1914, being called up as a Reservist. He was formerly employed at the Nautilus Works, by Messrs Appleby and Childs, and as a Salvation Army insurance agent. Letters from officers speak of Gunner Rose in terms of affection and with admiration of his soldier-like qualities. He took part in the retreat from Mons and most of the big battles of the war, having several narrow escapes. He had served in the RAMC, the RGA and the Mechanical Transport. At the Salvation Army Temple on Sunday afternoon and evening, Adjutant C Newton alluded to the life and death of the deceased, and expressed the deepest sympathy of all connected with the corps with the bereaved widow, mother and family in the terrible blow they had sustained." William was interred in H.A.C. Cemetery, Ecoust-St. Mein, Pas de Calais, France - Grave III.F.15. and his name is inscribed on the War Memorial in the Borough. The Commonwealth War Graves Commission certificate in memory of William Rose. William Rose's Commonwealth War Graves Commission headstone.